Personaggio - Canaglia - Wookiee. Punti: 12/15. Salute: 13. 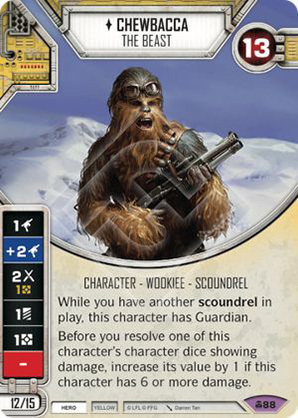 While you have another scoundrel in play, this character has Guardian. Before you resolve one of this character's character dice showing damage, increase its value by 1 if this character has 6 or more damage.